Some weeks ago I visited a local music shop – the Music Store in Cologne – who have a dedicated custom shop showroom. Lots of custom shop Fenders, expensive Les Pauls, and other fancy stuff. In the upper right corner of their wall full of guitars I immediately spotted a red Strat that looked nice – can’t help but red guitar always seem to attract my eyes quicker than any others 🙂 . I took it down and played it, and – WOW – it not only played great but had an absolutely stunning sound! (In fact in such situations I don’t need to plug it in, the acoustic sound is enough for me – just as a sidenote). 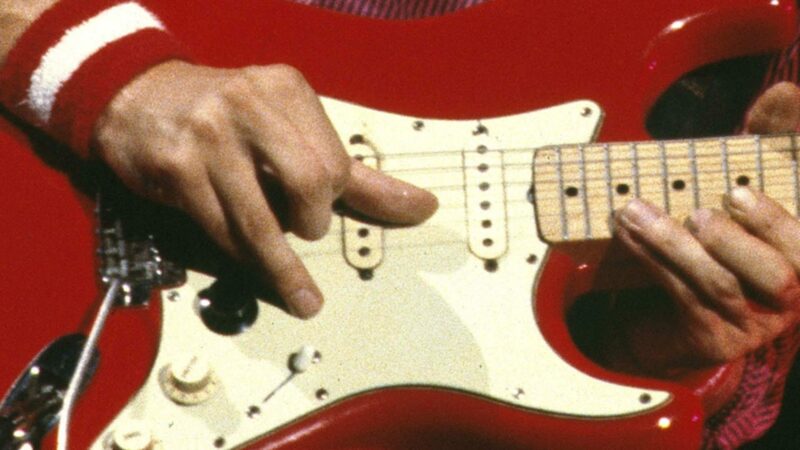 What was striking about that guitar were some unusual features that immediately made me think of my all-time favourite guitar – the one that made me start to play in 1979 – Mark’s red maple-neck Strat ‘80470: a laminated maple fingerboard (instead of a one-piece maple neck, thus no skunk stripe), a 1959-62 style pickguard (the position of that screw…), otherwise vintage specs. One difference was the colour which was fiesta red (Mark’s was more towards what is called hot-rod red today, or even dakota), and the relic finish (Mark’s was refinished and looked like new). I asked for some information on that guitar and learned that it was a limited run (of 20 guitars) by the Fender custom shop. I admit I was thinking about buying for some time, but finally decided not to do (I really can’t say I am in dire need for another red Strat…). 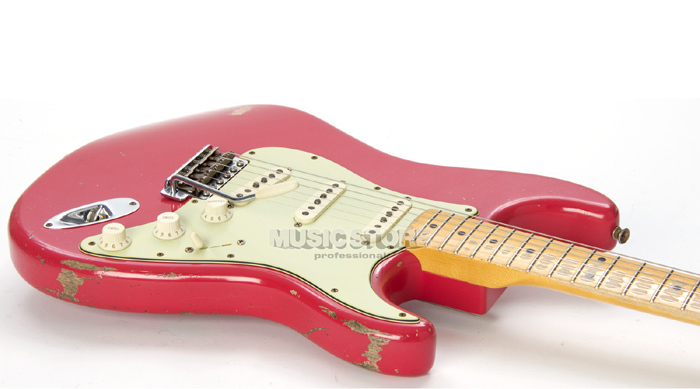 What are Mark Knopfler’s vintage guitars worth? I see the shop website specs show that Fender installed a different style pickup in every position. Thanks for the vid and info Ingo. What amp did you use for reamping the DI-signal? Sounds like a mighty fine amp! I can absolutely confirm what Rainer says about the Kemper: never had such a device before and I´ve been unsuccessfully tried this and that on the market before to achieve the Mark Knopfler sound (incl. some expensive stuff). I also own the fine ’63 Vibrolux profile, which was built by a pro (Andy from The Amp Factory). Love that guitar. How do you feel a laminate maple fretboard affects the sound versus a 1 piece? Which do you prefer? I love the look of the maple cap fingerboard. I can imagine that it affects the tone in some way but honestly I cannot tell what difference it makes here. It did not sound too much different from what you expect from a one-piece maple neck. I once read that many people can’t tell the difference between a maple cap or a rosewood board. This leads me (and others) to believe that biggest determinant in tone isn’t wood type, but construction method. That’s why when I shop for guitars, I look more at construction type than what the wood is. An alder body barely qualifies as such if it’s 3 or more pieces. While I agree with you that construction is important, I don’t think it’s the most important. Neither do I agree that wood is less important. You can’t put it that way, because there is no such thing as ‘wood type’. I firmly believe that each guitar (and thus every wood) is unique. None sounds the same. You may not be able to distinguish maple from rosewood if both aren’t of any special quality (for example sound muddy). But boy can a light, dry, nicely resonating wood make a difference. These characteristics are actually top priority for me personally, rather than construction. However, indeed a 3 piece body usually is a no go indeed. I like playing on a one piece maple neck, beacuse it’s the only way to play “directly” on the neck. I think it has a sort of raw interaction with the wood. as far as I know, the originals tele and strat (50s models) are the only guitars on which you play directly on the neck. all others guitars acoustic or electric(gibson, rickenbaker, ibanez….) have a fingerboard. I think it’s a distinctive side of the strat. Mark had is one piece maple neck time : from 180 to 185 with schecters. Then He started to use Gisbson, steinberger, the white strat, and switched (again) to rosewood fingerboard, and kept it with the pensa, and later the sig strat. the only one piece neck guitar he still uses is the 54 strat. The maple-cap 84070 was a ’62 model based on the description and photos you’ve posted on Twitter. If you want to know about tone of woods for the neck. 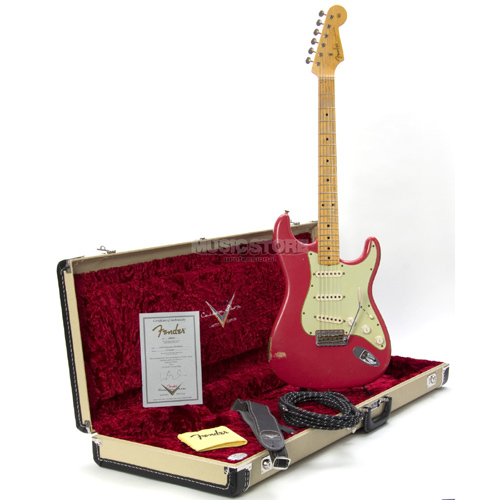 –	Tundra Music has a sweet in stock selection of Fender Custom Shop Guitars with the new Josephina Hand wound pickups. –	You know if they are vintage specialist there only getting the best new stuff! –	Hope you guys enjoy… let me know what you think…. 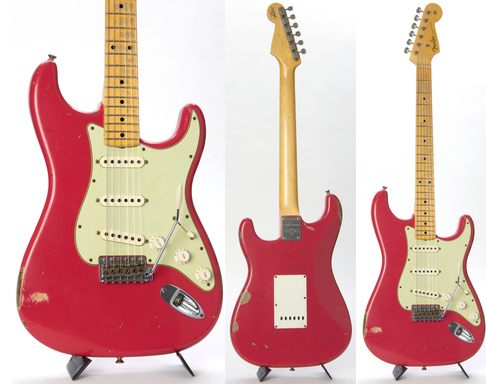 There are a few modifications done on the original Fiesta Red ’61, most notably a black volume knob and the switch from maple to rosewood neck. I suppose the black knob was fitted circa ’77/’78 and the neck swap occurred around mid-to-late 1979/early 1980, a couple of months before Mark switched to Schecters. There was no swap/switch from maple to rosewood neck. What you are confusing here is that Mark had two red Strats, one with a maple (cap) neck, one with the rosewood neck. Mark swapped the whole pickguard (incl. the black volume knob) several times between these guitars. This is why you think it was swap of the necks. The black volume knob was on the 61 already on the oldest piture we have, from September 1977.